Cloud provisioning primarily defines how, what and when an organization will provision cloud services. These services can be internal, public or hybrid cloud products and solutions. Internet and programmatic access and are only billed for resources and services used according to a subscribed billing method. <! [if !supportLists]> · <! [endif]> Infrastructure as a Service(IaaS): May include virtual servers, virtual storage and virtual desktops/computers. <! [if !supportLists]> · <! [endif]> Software as a Service(SaaS): Delivery of simple to complex software through the Internet. <! [if !supportLists]> · <! 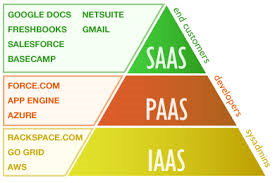 [endif]> Platform as a Service(PaaS): A combination of IaaS and SaaS delivered as a unified service. When a cloud provider accepts a request from a customer it must create the appropriate numbers of Virtual Machines (VMs) and allocate resources to support them. The process is conducted in several different ways: advance provisioning, dynamic provisioning and user self-provisioning. <! [if !supportLists]> · <! [endif]> Dynamic/On-Demand Provisioning: The customer or requesting application is provided with resources on run time. <! [if !supportLists]> · <! [endif]> User Provisioning: The user/customer adds a cloud device or device themselves. <! [if !supportLists]> · <! [endif]> Post-Sales/Advanced Provisioning: The customer is provided with the resource upon contract/service signup.